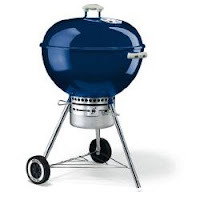 Pictured here is the Weber Gold, a 22.5" kettle style grill with dome vented top and an ash catcher on the bottom. This is a really great grill. Weber also makes a Silver model that is 18" in diameter without the removable ash catcher. Weber makes a VERY fine grill. Ask anyone that has ever owned a Weber and they'll tell you that they are built to last. They are also very versatile in your outdoor kitchen. Not only can you grill on the Weber, you can also use it as an oven, a convection cooker and a smoker. Today we are going to learn how to slow cook some awesome tasting pork spare ribs, cooked slow and with smoke. This method is used even at BBQ competitions. With the larger Gold series Weber, you can do about 3-4 racks of ribs and with the Silver, up to 2 racks. This method works with baby back ribs, st. Louis style or a full rack. The night before you want to smoke your ribs, you'll want to prepare them. Trim off the fat and the loose end, usually referred to as the tips. The lose end can be smoked with the ribs but will finish first, and it is good as a treat or diced up and added to your BBQ beans. Remove the membrane from the back of the ribs. Skipping this step results in less flavor and moisture in the meat. Rinse the rib racks and pat dry. You can cut the racks in half to make them easier to handle, but I prefer to smoke whole racks. Rub the ribs down with extra virgin olive oil or mustard. ( don't worry, you won't taste the mustard after cooking. It makes a nice bark and bonds the rib rub). Liberally coat the ribs with your favorite BBQ rub. Store bought is OK, just look on the same aisle that carries spices. They usually come in a 6-8 oz shaker and will have all kind of teasing names like "Sylvia's Magic Rib Rub" or "Paul's BBQ Rub". You may also find them near your grocer's meat department. Double wrap the ribs in clear wrap tightly and store in the fridge at least for 4 hours to allow the spices to permeate the meat. Do not let sit for longer then 24 hours, as the rub will eventually over power the flavor of the meat. Remove the wrapped ribs from the fridge about 1-2 hours before placing on the grill. Ignite about 20 coals or a similar amount of lump charcoal in a starter chimney. I do not believe in using liquid starter simply because of safety and flavor. I don't want my food tasting like lighter fluid. At this time, go ahead and soak some wood chips or chunks of apple, mesquite, hickory or pecan. When the coals are good and hot, pour them out onto one side of the Weber, banking them up the side. On the other side, place a drip pan or make one with aluminum foil to catch the drippings. Place the cooking grate on top. Directly over the coals, place a small pan of water for moisture inside the kettle while smoking. This is optional, however if you don't do it, make sure to have a spray bottle with apple cider or juice in it to spritz the ribs from time to time. You'll need to add more chips about every 30 minutes, chunks maybe one an hour. Monitor the temp inside the kettle and maintain a temperature of about 230-250 degrees. You can regulate the temp by adjusting the vents on the bottom of the kettle. Always leave the top vents open half way or more. The trick with slow smoking great ribs is temperature and smoke control. The smoke should not come billowing out and white, it should be wispy and bluish in color. Make sure you add a little wood at a time, less is best. Place the ribs over the drip pan, on the opposite side of the coals. You may need a rib rack which can be purchased at any Wal-Mart or hardware store to stand the ribs up. The damper on the top of the kettle should be placed over the meat. This will draw the heat and smoke over to the meat as hot exhaust air escapes. You're all set. Kick back and relax. In a little while, the smell emanating from your Weber will start to draw strange looks from your neighbors. They'll see smoke coming from the Weber and wonder what you have going on in there that smells so darn good. It'll take 4-6 hours for the ribs to smoke to juicy tenderness. Add wood and coal as needed to maintain wispy smoke and a temp of around 250. You'll know when the ribs are ready, the meat will be pulled back from the bone ends and you should be able to tear off the end rib with little effort. About 30 minutes before you remove the ribs from the Weber, mop them with your favorite BBQ sauce and toss on a few chips. This will allow the sauce to set without burning and add a bit of smoke flavor to it. Allow the ribs to set up for about 10-15 minutes before carving to allow juices to redistribute. The meat should be gray near the bone and pull off with just a bit of resistance. The meat on the outer portion will be pinkish in color. This doesn't mean the meat isn't cooked, it's called the smoke ring. The smoke causes a chemical reaction that turns the meat pink. I hope you enjoyed reading this. You really can cook restaurant style ribs at home using your grill. Stop par boiling your ribs, it takes the flavor right out. For juicy fall off the bone ribs, just slow cook em! Until next time, Keep on smokin! This weekend, the Weber will transform into a convection oven for some apple dumplings. I can't wait to blog it. Thanks for the well-written piece! I have taken this and run with it, using the Cooks Illustrated rub. Thanks for the reply. I'm glad the article was of some use to someone. I'm confused on where to put the wood chips? Definitely trying this tomorrow. Thanks for the instructions. The wood chunks or chips can go directly over the coals on the hot side of the fire. I've used a Weber for direct heat grilling for decades, so I am looking forward to my first batch of slow cooked ribs for the 4th. Thanks for the well written piece and instructions. Someone above mentioned using the grill as an oven. I assume it works well for savory baked goods, but I wonder if sweets would get an odd taste from all of the meat that was cooked in the grill before. Thanks for the great instructions. I've been using a Weber for years, but this is my first time slow-cooking/smoking ribs. The whole process was fun, and went perfectly. And of course the ribs tasted great! The weber is awesome for slow cooking. I'm glad your cook out turned out great. I tried it for the first time and it worked great. Couldn't have been much easier. Now I'm ready to try some other types of ribs! !